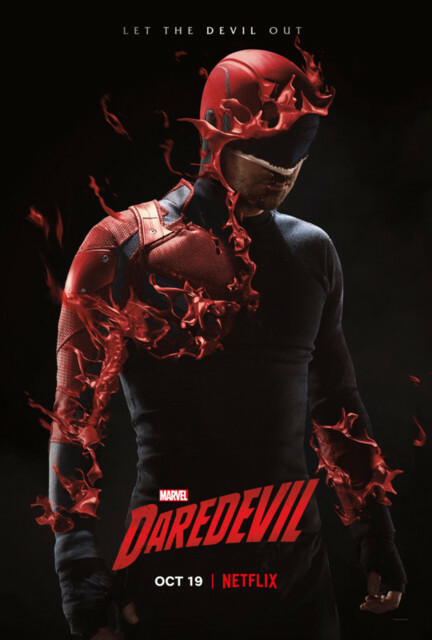 Daredevil News - Daredevil: The Man Without Fear - Your #1 trusted source for all Daredevil news since 1996! 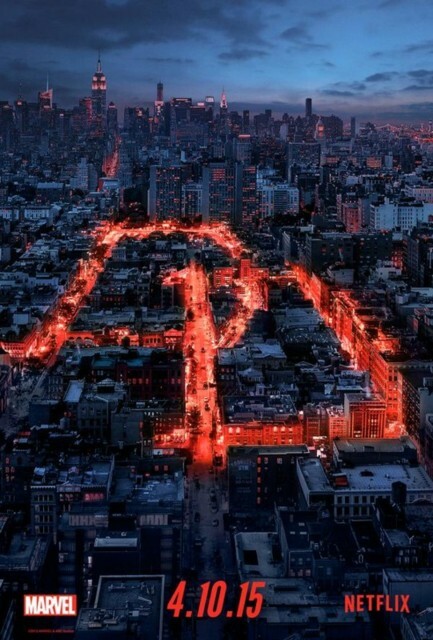 Your #1 trusted source for all Daredevil-related news since 1996! Please check out the new archive of news! 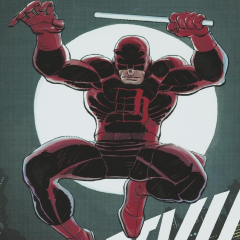 Here's the latest Hidden Gem variant for DAREDEVIL #5 by John Romita, Jr.! There's one more coming for #6, so stay tuned for that cover soon. #5 ships May 15th. 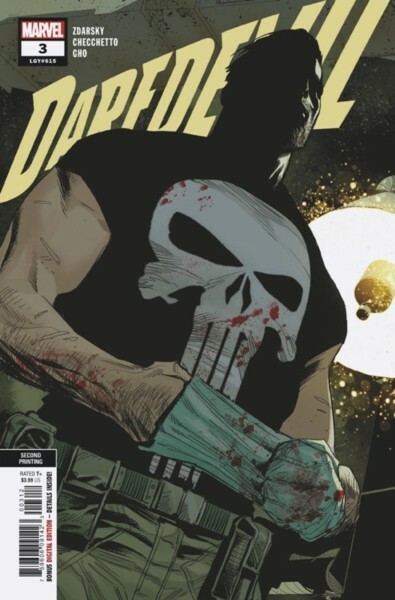 July 2019 solicits are now up on the site. 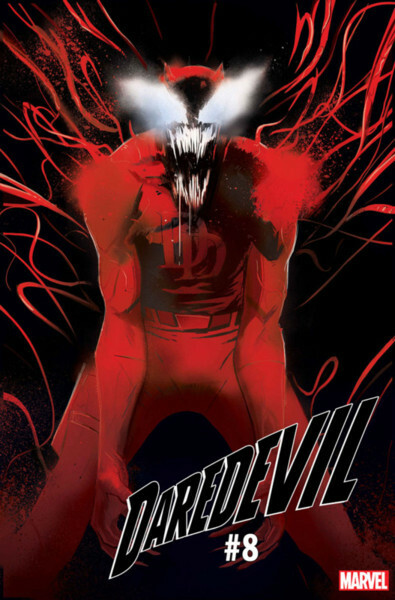 DAREDEVIL #8 continues the arc with artist Lalit Kumar Sharma, with Chip Zdarsky continuing his covers. 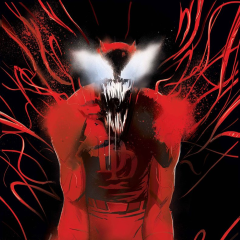 The first collection has also been solicited, containing #1-6. 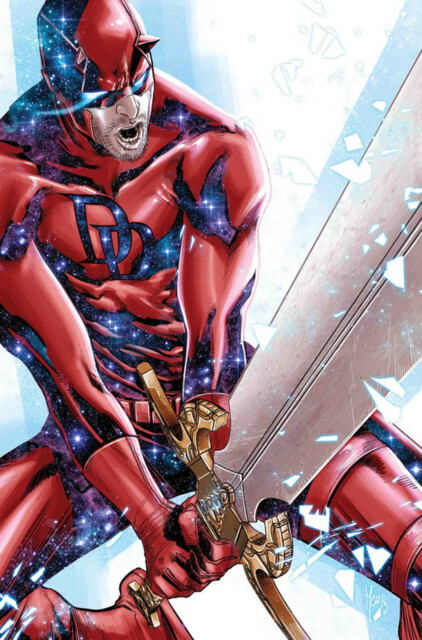 There's a new printing of ELEKTRA ASSASSIN, the WAR OF THE REALMS TPB, and the DD BORN AGAIN ARTISAN EDITION TPB! 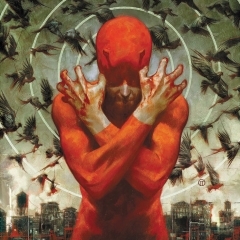 The DAREDEVIL #3 2nd printing was announced a few weeks ago, and today the cover was released. 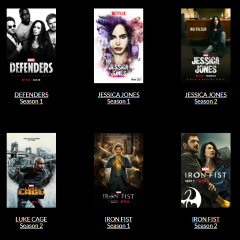 Earlier this year I added all the productions stills made available by Netflix for the three DAREDEVIL seasons and DEFENDERS, and today I've added over 500 images from all seasons of PUNISHER, LUKE CAGE, IRON FIST and the first two seasons of JESSICA JONES! 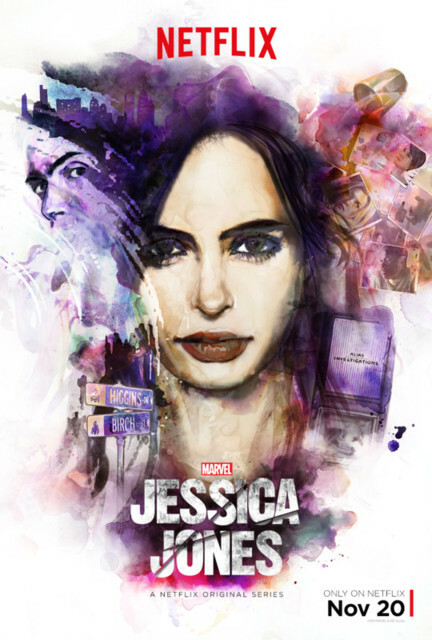 I'll keep a section on the main page for all of the shows, and when JESSICA JONES Season 3 comes, I'll add those as well. 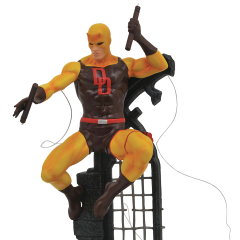 If you missed out on the 2012 David Mazzucchelli Daredevil Born Again Artist's Edition, IDW will be releasing a new format called "Artisan Edition" and the first release will be Born Again. It will be smaller in size and paperback, but will have the same contents as the Artist's Edition. 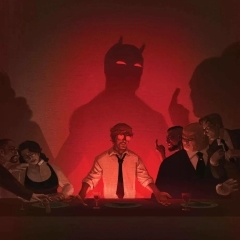 Enjoy the acclaimed graphic novel as an ART BOOK! Each page of this classic story is reproduced from the original art--while appearing to be in black and white, the art is scanned IN COLOR, capturing all the nuances (blue pencil, white out, etc) and quirks that make original art unique! 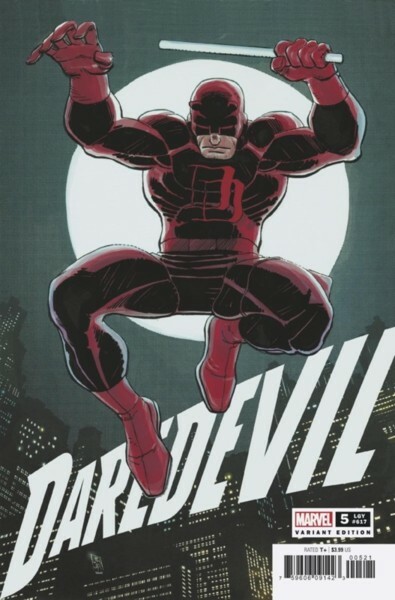 DAVID MAZZUCCHELLI'S DAREDEVIL BORN AGAIN was released in the much lauded Artist's Edition format in 2012. It soon became the best-selling Artist's Edition of all-time and was universally acclaimed. In 2013 the book received the prestigious Eisner Award for Best Archival Project--Comic Books, as well as a Harvey Award the same year. It soon sold out and has been the single most requested AE book to date for IDW to reissue. So it is only fitting that IDW launch its new MARVEL series of Artisan books with this award-winning classic! 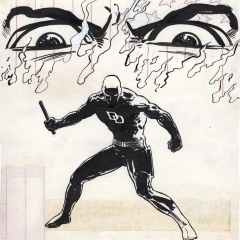 Just as the original release, DAVID MAZZUCCHELLI'S DAREDEVIL BORN AGAIN ARTISAN EDITION features the same scans--entirely from the original art--each painstakingly done by David Mazzucchelli himself to ensure the finest quality possible. 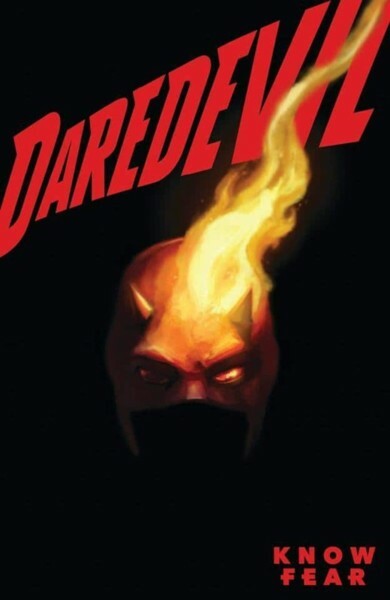 If ever a book deserved to be in this format it is Daredevil Born Again. Frank Miller, at the peak of his powers, crafted a story that remains--in an extraordinary career--one of his finest pieces of writing. And David Mazzucchelli does a stellar tour de force job as his collaborator, providing a nuanced and nearly pitch-perfect turn as artist. If there is any book deserving to be re-read and rediscovered... this is the one! Look for the Artisan Edition in September. A Diamond Select Release! Have you started your Gallery? 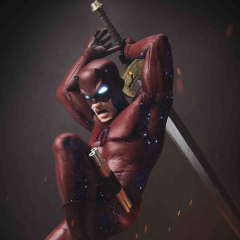 The Marvel Gallery line has offered characters from Marvel comics, movies, and television, but Daredevil has made his mark on all three! 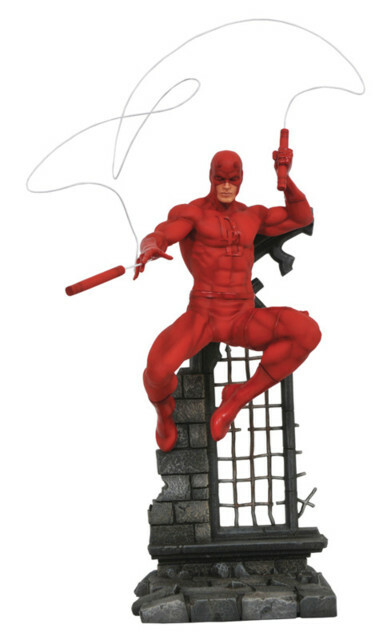 Based on his classic comic book appearance, this 9" scale PVC diorama of Daredevil shows the Devil of Hell's Kitchen leaping from a church rooftop and letting fly with one of his billy clubs. 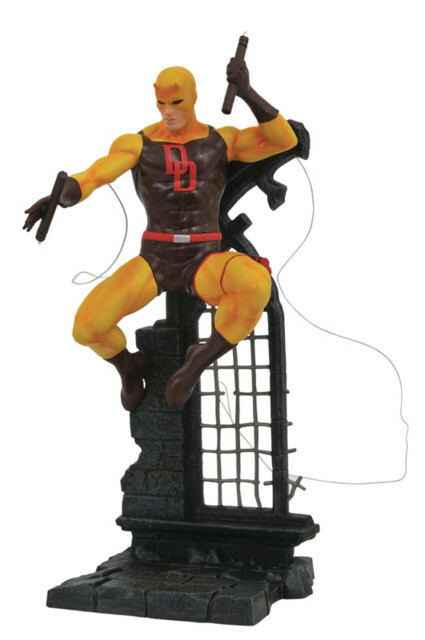 Measuring approximately 11" tall, this figure is in scale to all Gallery and Femme Fatales PVC figures, and comes packaged in a full-color window box. Sculpted by Ramirez Studios! Limited to 1000 Pieces! 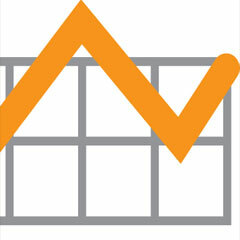 Note: If allocations occur, Summit attendees who are registered by April 30 will receive first priority. 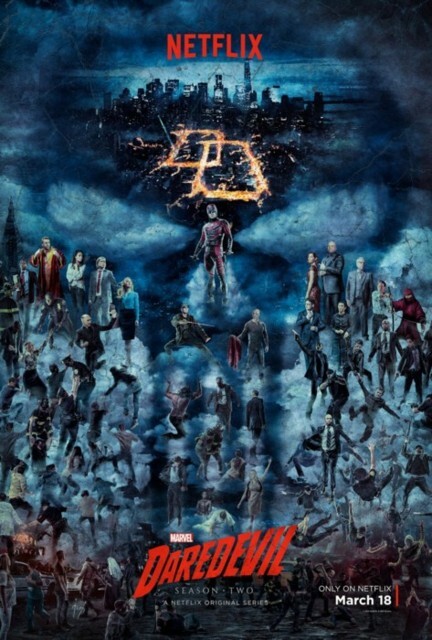 In December, Marvel had an industry sale for the costumes, clothing, shoes etc. 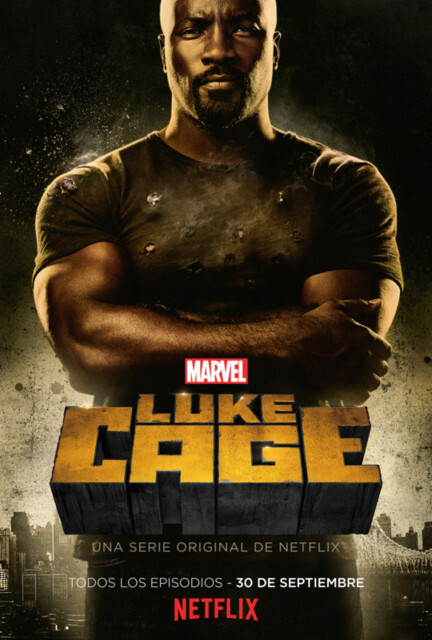 from DAREDEVIL, LUKE CAGE and IRON FIST. 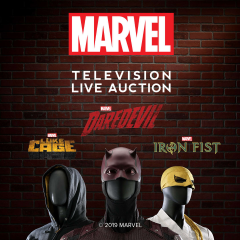 Today Marvel tweeted about an auction through Prop Store for about 750 items from the previously mentioned shows. The auction will take place in California, but fans can participate online or by phone at the Prop Store site. You can also sign up for email updates. 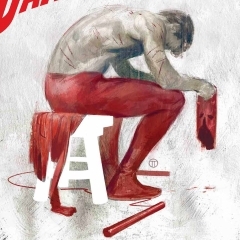 The DAREDEVIL #1 3rd printing was announced last week, and today the cover was released. It's a slight variation of the 2nd printing, with a black & white background and black logo. 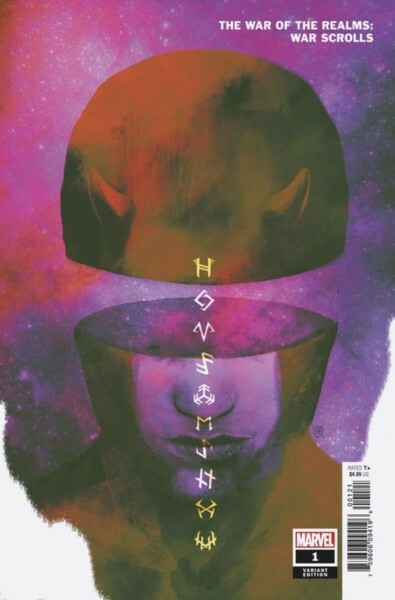 June 2019 solicits are now up on the site. 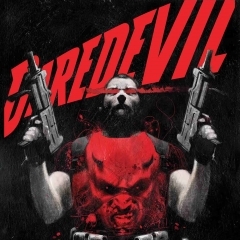 DAREDEVIL #7 continues the new arc with artist Lalit Kumar Sharma, and Chip Zdarsky is doing the covers for a few issues. 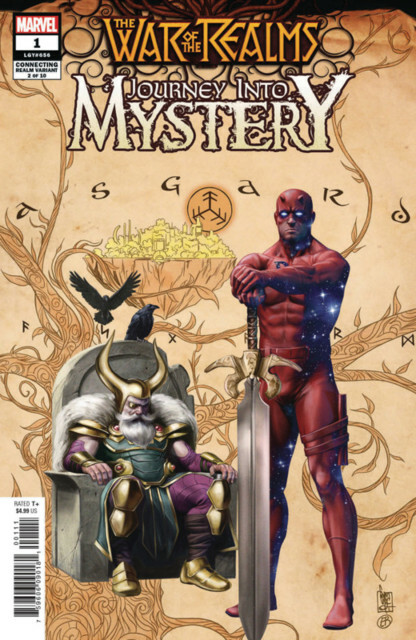 DD also continues his appearances in WAR OF THE REALMS, and also the mini WAR SCROLLS. 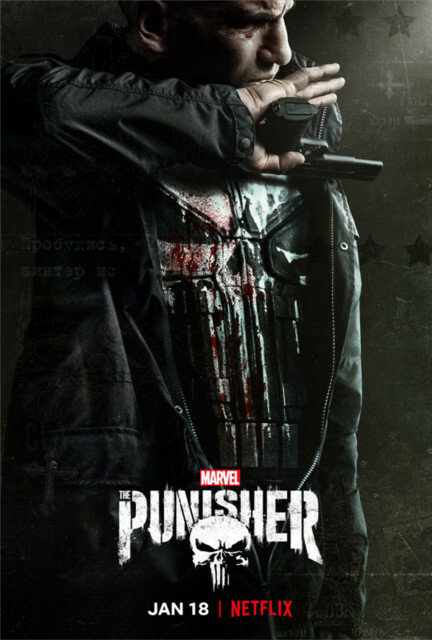 In October we will also have the Frank Miller Box Set! 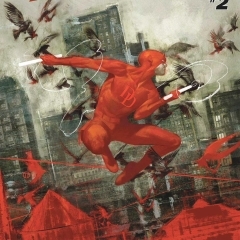 The DAREDEVIL #2 second printing was announced a few weeks ago and now the cover has been released. 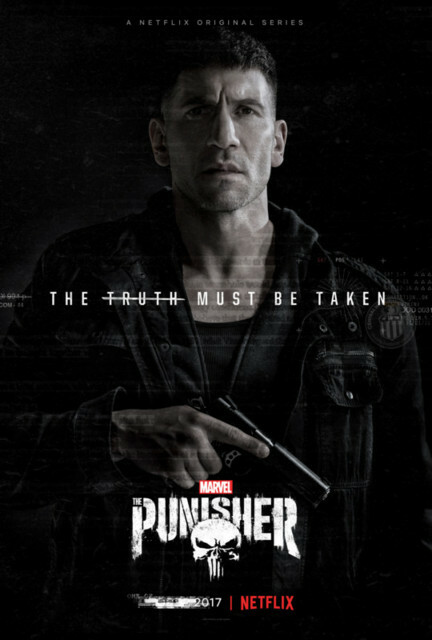 If you haven't read the issue yet, the cover has lots of spoilers, so be warned. 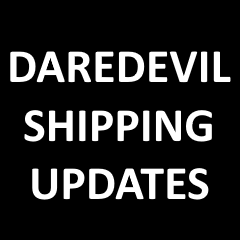 Made some new updates to the site... now the front page will have all the latest shipping updates displayed right at the top for easy access with links to information. 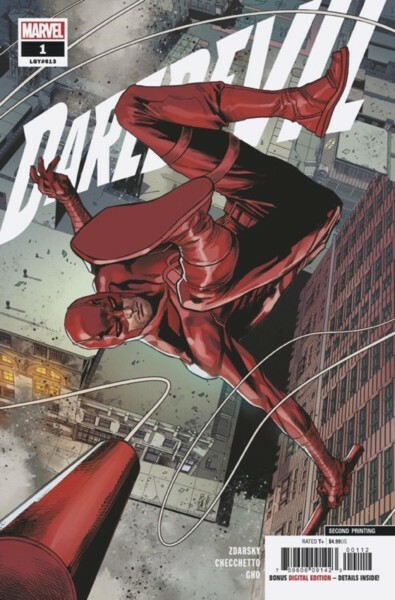 DAREDEVIL #1 is going back for a third printing! 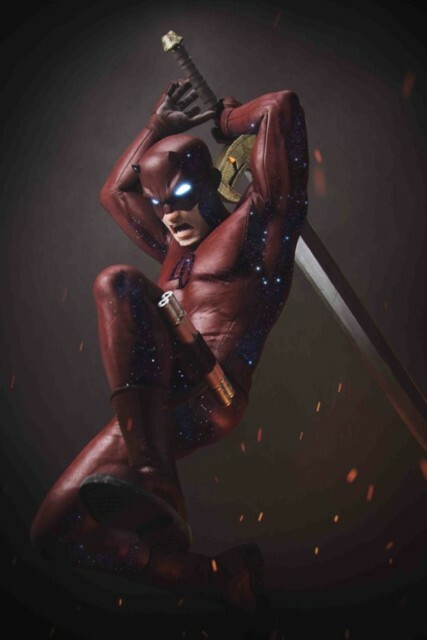 Keep checking back for updates for all DAREDEVIL comics, including his appearances in WAR OF THE REALMS and his mini series WAR SCROLLS. 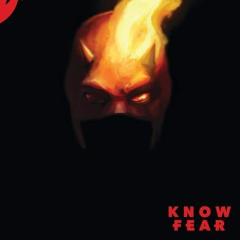 The latest volume of DAREDEVIL's sales data hasn't been released yet, but in the meantime, the MAN WITHOUT FEAR series came out in January and had all five issues in the top 100. 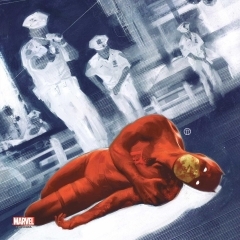 There were also second printings of the DEATH OF DAREDEVIL arc, adding a few thousand to the totals for #609-612. 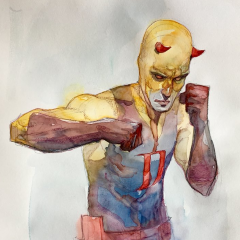 Former DAREDEVIL artist Alex Maleev took to Twitter to talk about a piece that was stolen from him. Please be on the lookout and let him know if you see it on sale anywhere. 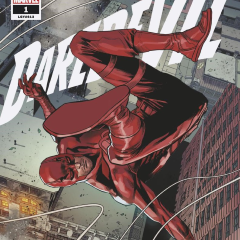 DAREDEVIL #3 is coming in March, and there will be two variants. 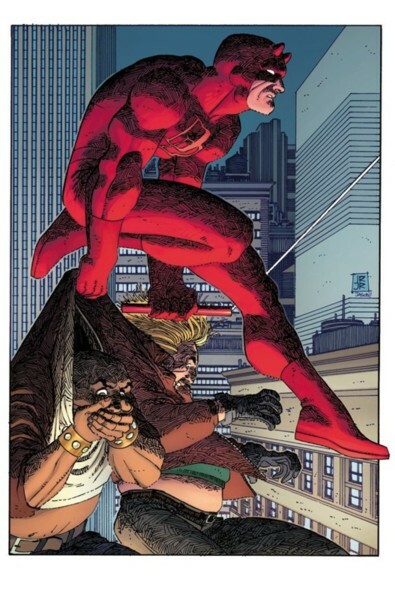 One is the "Cat Variant" and also another John Romita, Jr. "Hidden Gem". These new covers by Romita Jr. are not new, they are from a French portfolio in 1991 which had six prints. 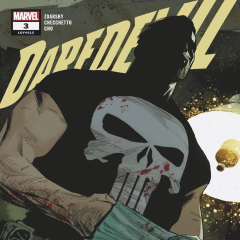 May 2019 solicits are now up on the site. 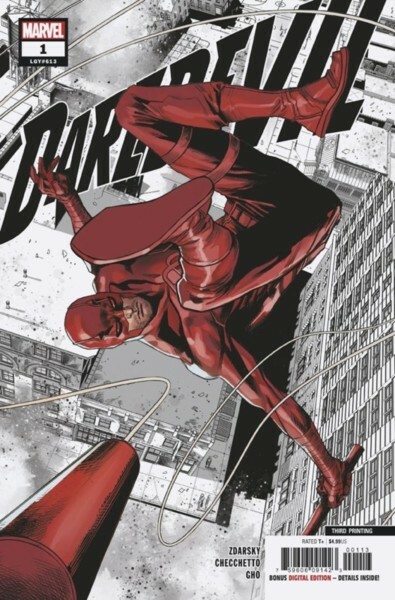 The DAREDEVIL solicits are no longer "classfied", as issues #5 and #6 have details listed for the first time this volume. 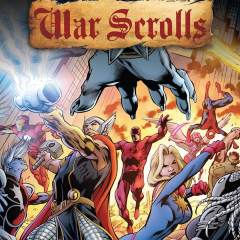 DD also continues his appearances in WAR OF THE REALMS, and also the mini WAR SCROLLS. 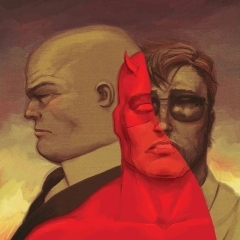 There's a new TPB of the former DAREDEVIL: SEASON ONE, and the latest EPIC COLLECTION "PURGATORY & PARADISE". 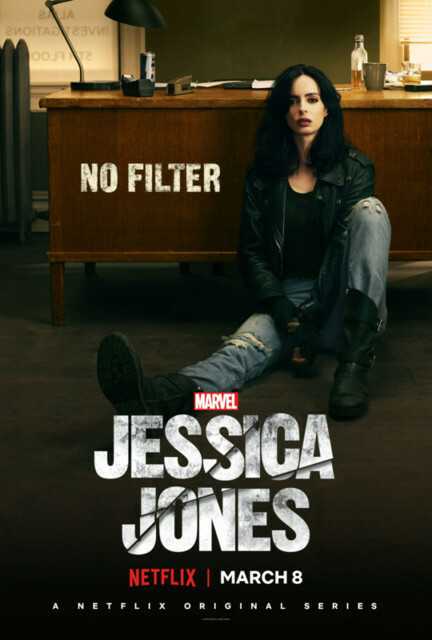 In a move that was expected, but maybe not this soon, Netflix has canceled both PUNISHER and JESSICA JONES today, but the third season of JJ will be released this year. So, what does this all mean? 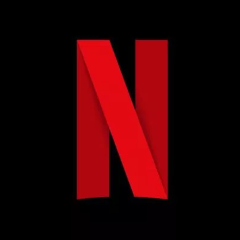 The existing versions of these shows will remain on Netflix, and it has been rumored that the rights to the characters will remain with Netflix for two years after cancellation. 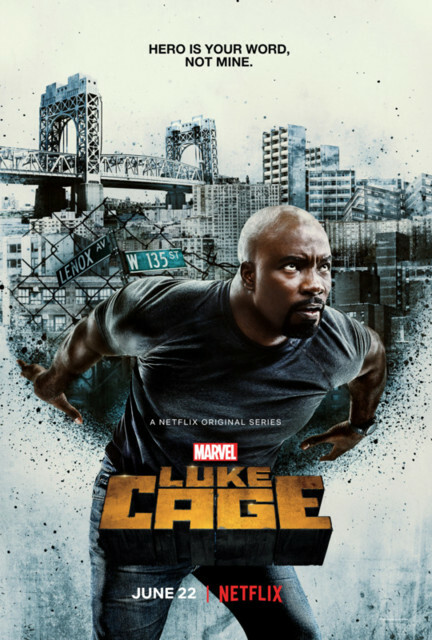 With Disney+ coming, and Disney's share in Hulu increasing to 60%, there's a good chance some version of these shows will continue, but will it be a reboot or will some of the actors return? 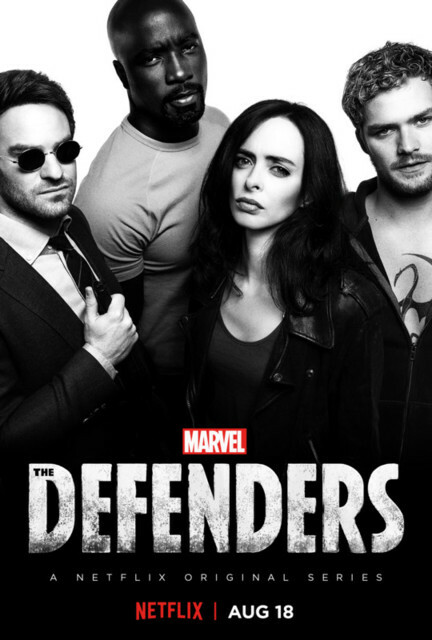 The Marvel Netflix shows were announced in November 2013, with the original agreement being 13 episode seasons of DAREDEVIL, JESSICA JONES, LUKE CAGE and IRON FIST, with a mini series for DEFENDERS. 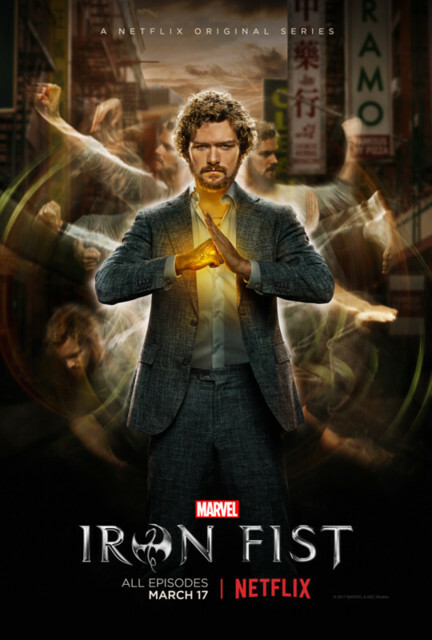 But the shows were successful, adding PUNISHER, three seasons of DD, three seasons of JESSICA JONES, two seasons of LUKE CAGE, and for IRON FIST, and two for PUNISHER. UPDATE: Click HERE for the solicitation. 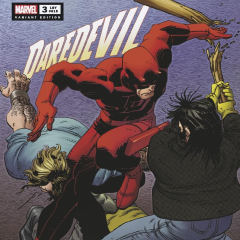 Coming in October is a new paperback box set that will contain all of Frank Miller's work on DAREDEVIL (and also Elektra). 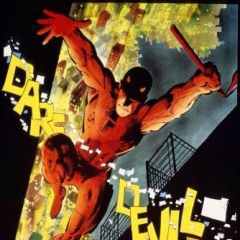 Description: Visionary creator Frank Miller's complete saga of Matt Murdock and his first love, the lethal assassin Elektra Natchios - in a single, exhilarating box set! 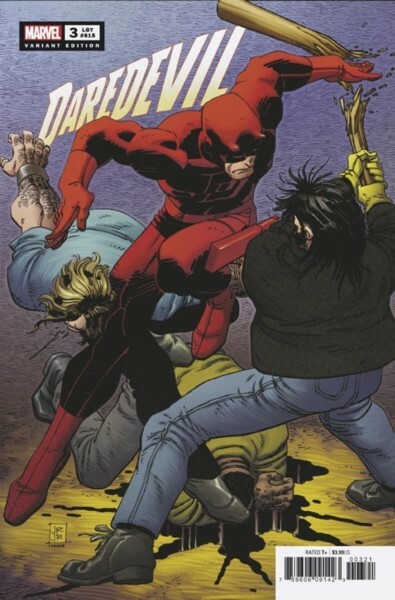 One of the greatest runs not just in Daredevil history but in all of comics, Miller also introduced Stick and the Hand to the DD mythos, and established the Kingpin and his sadistic marksman Bullseye as Matt's deadliest foes. Plus the stunning graphic novel Love & War, Miller's revolutionary revisit of the origin of the Man Without Fear, the starling continuation of Elektra's story, and much more! 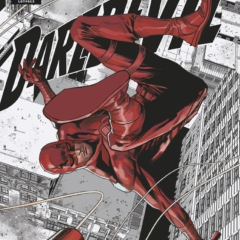 The Comic Industry Annual Meeting sponsored by ComicsPRO will be taking place on February 21-23 and retailers will be getting a goodie bag of variant covers and Marvel has included a DAREDEVIL #1 cover by Chip Zdarsky. 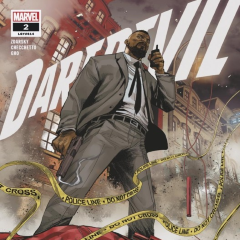 If you want to get a hold of this comic, it is limited to a few hundred copies, so you may have to pay a premium at your comic shop if they get a copy. 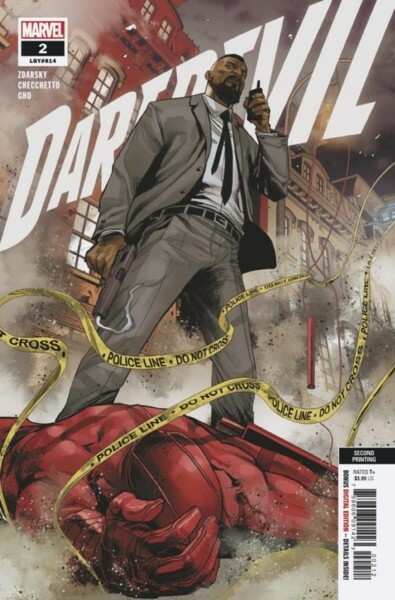 And Marvel is doing some "cat themed" variants in March, and DAREDEVIL will have a cover with a cat and Ms. Marvel on it? Celebrate Captain Marvel with cat-themed comic variant covers this March! 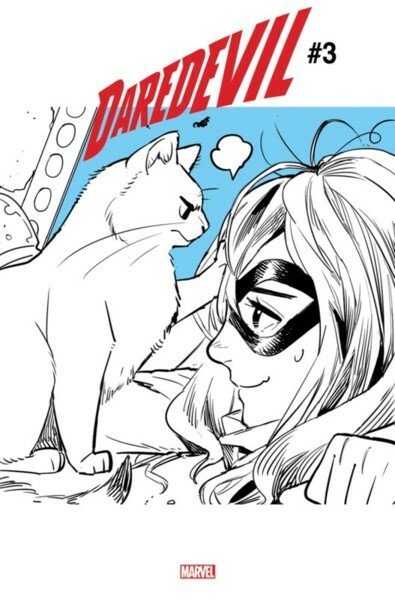 New York, NY—February 14, 2019—From Black Cat to Hellcat to Kitty Pryde, cat-themed heroes have had an iconic presence in the Marvel Universe – this March, celebrate CAPTAIN MARVEL as Marvel pays homage to one of comics’ most famous felines with a series of MARVEL MEOW variant covers by Japanese artist Nao Fuji! Each variant cover will feature a mini comic centering on heroes like Ms. Marvel, Spider-Man, Captain Marvel, Rocket and Groot, Carnage and Venom, and Wolverine – proving there is nothing cooler than a cat who hangs around super heroes! Please note that the art on the attached covers is one panel of a nine-panel comic. Keep checking Marvel’s Instagram to see the full comic strips, which will also be featured on the variant covers of these select March books! 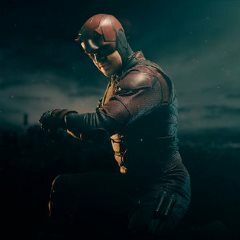 I've added a major new addition to the site, with over 500 production stills from all the seasons of DAREDEVIL as well as DEFENDERS. 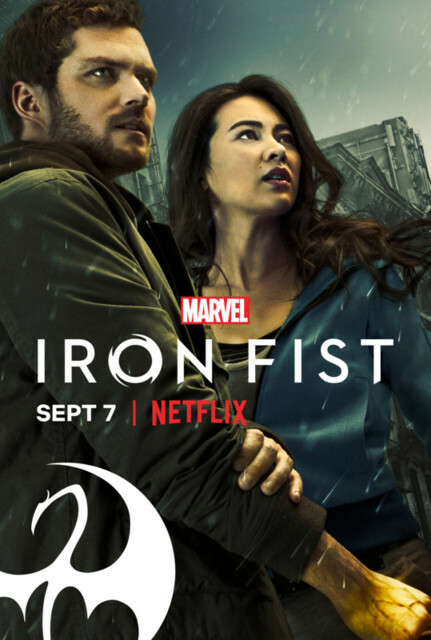 These are all from Netflix and also include pics from the premieres and comic conventions. 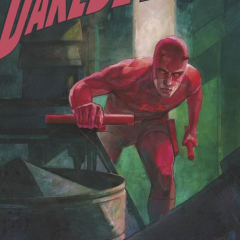 DAREDEVIL #1 debuted on February 4th, 1964. 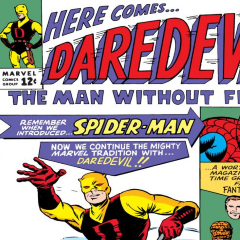 Created by Stan Lee & Bill Everett (with input from Jack Kirby and Steve Ditko), the character has been published for over 55 years across 6 volumes (starting this Wednesday).